Proud Mummy Alert! | An alien voice under a duvet of dreams. Posted by phoenixaeon in Homework with Principessa, Proud Mummy, Reading with Principessa, the perfect word. Yes, it is a day for peacock feathers. Words are like weapons and this has certainly been in the wars! So she read the book she had to write a synopsis for last night. We talked about the story so she could work out what she wanted to write and off she went. But then she hit one sentence where she decided she wanted to break from the norm of simple explanatory words and use something a bit more sophisticated. She wanted to find a word synonymous (yes, she even knew that it was a synonym that she wanted) with happy. So she tested out some words – liked, loved, joyful – but they didn’t seem to fit with what she wanted. Then *lightbulb*. She decided to look for her thesaurus. 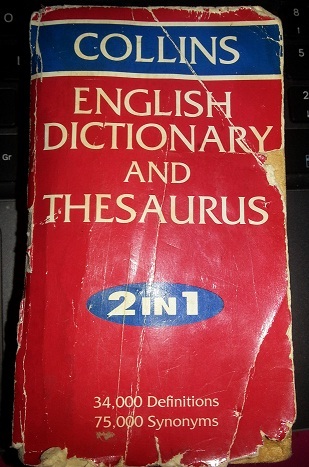 Unable to find hers, she dug out my old, battered pocket Collins dictionary and thesaurus and searched for the word. Still nothing. But then she saw the word propitious. So I told her that if she wanted to use that word, then she should check in the dictionary to make sure that it would fit properly in her sentence. She opened the dictionary side of the Collins, but lo and behold! The word wasn’t there! I gave her my computer and she typed the word into the search engine. Giving or indicating a good chance of success; favorable. Perfect! The word fit exactly! It described exactly what she wanted to say. The sentence? ‘The snow, the frost, the north wind and the hail found this very propitious.’ And what did they find propitious, you may ask. Well, the story was about a selfish giant who lost spring, making it eternally winter in his garden. The perfect conditions for the snow, the frost, the north wind and the hail. This made Princi very happy, knowing that using propitious would be very propitious for her when her teacher reads her homework next Monday.